Job loss is an issue that most people encounter at some point in their working life. Whether it’s due to redundancy or being fired, it’s no less distressing. Uncertainty and fear of the unknown can paralyse people into apathy and lead to depression. The most important next step after job loss is to grasp the reins and take control of the situation. Here are a number of tips for staying on top of things. Focus on finding possible jobs This may seem obvious but it’s often the case that people take an extended break to ‘recover’ from a stressful exist process, particularly those who have been made redundant and have walked away with a lump sum. Remember that the job market waits for no one. In a major economy, if you are out of work for more than 3 months it starts to become an obstacle to recruitment. This is why it’s so important to swing into action immediately. Taking immediate action provides you with that all-important sense of control so take the following actions immediately. Join The Library There’s a good reason for joining the library. Cash will be limited but you will need access to lots of information. It’s a good idea to visit the library on a daily basis to scan the daily newspapers for jobs. The library also provides valuable company research information which is essential for putting your best foot forward in an interview. You will also need to rewrite your resume so that it complies with the latest resume writing standards so borrow books on that subject. It’s important to get your head around interviewing questions and interviewing techniques, such as what to expect in a behavioural-style interview. In addition to this and depending on the level of the role you are aiming for, you may benefit from an understanding of psychometric testing so see if you can borrow some books on that subject. Create a Filing System A filing system helps you to stay on top of things. You will probably apply for a number of jobs every day and will need to keep track of them so that you don’t reapply for the same job. It’s also important for following up after an interview. A filing system helps you to organise contact details for agencies and former colleagues who may be able to assist you with your job search. Write Out Your Budget It will be a shock to the system when you face the reality of having no income; therefore, understanding where your money is being spent is essential for your survival. However depressing it may be, this knowledge adds to your sense of control. You can then see where you can cut down on spending. Join a Relevant Professional Organisation Even though cash may be limited, joining a PA professional organisation is important. There are a number of reasons for this. Firstly, professional organisations are ‘fonts of knowledge’ so they provide a valuable roadmap and resource for professional PAs. Secondly, PAs can join at a number of levels (basic, intermediate, advanced). Even if you join at the basic/affiliate level some professional organisations will allow you to use certain letters after your name – this looks good on your resume. Thirdly, it’s good practice to include a section at the end of your resume to highlight any professional organisations you belong to. This sends the right message to the hiring manager and says that you are a serious personal brand. If you have experienced job loss it’s important that you immediately increase your circle of influence. The best way to do this is with active networking. First and foremost, get some business cards. You can order them online for free from Vistaprint for the cost of postage and packaging. Business cards say you are serious about yourself. They also suggest that you are a ’personal brand’ and people can’t help but be impressed by a PA with a business card. Attend as many networking events as possible, whether they are events aimed at jobseekers or at your profession. Even social events provide a good networking opportunity. The objective is to be seen and to hear other people’s stories because in there somewhere may be the link to your next position. A good strategy is to offer to help others – find out how you can help them. It could be that you can introduce them to someone, a good plumber or an accountant. Hopefully they will return the favour and tell someone at their workplace about you and your skills. Most jobs are never advertised so this is a possible way in. The use of social media is essential so make the most of your Facebook, Twitter, Linkedin connections. If you don’t have a linkedin account I suggest you get one as soon as possible and fully optimise your profile. Linkedin is a good tool for getting headhunted, for finding other PA professionals and for job hunting. This practical training offers the perfect solution to dwindling training budgets and allows your organisation to provide training at their premises with minimum disruption and at a very affordable price. 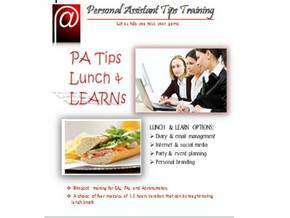 A full Lunch & Learn training programme can also be provided to companies overseas. 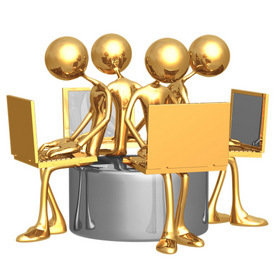 To discuss our training programmes contact Marguerita King on +44 7771 648521 or send an email to <>mking@personal-assistant-tips.com.